Bluetooth allows wireless devices like keyboards, mouse, speakers, trackpads to be used with the Mac, and while they usually work just fine, sometimes specific Bluetooth difficulties can arise and be very frustrating to troubleshoot. Maybe it’s a persistently disconnecting device, maybe it’s a device that refuses to acknowledge a specific Mac or vice versa. Sometimes disconnecting and reconnecting with new batteries or trashing the Bluetooth preferences and an SMC reset is enough to resolve the problem, but other times issues still persist. 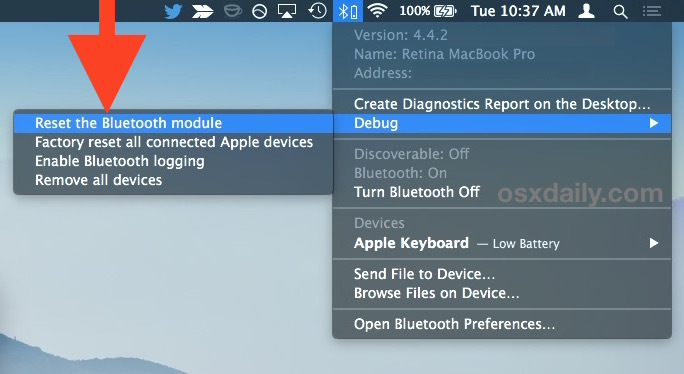 Rather than giving up, another approach for troubleshooting particularly stubborn Bluetooth problems is to reset the Macs Bluetooth module using a little known debug menu option. Keep in mind this is going to disconnect every Bluetooth device on the Mac, so if you only have a Bluetooth keyboard and mouse you’re going to temporarily lose the ability to use those devices as the Bluetooth hardware module is reset. You’ll notice there are several other options available in the Bluetooth Debug menu, including logging options, the ability to factory reset all BT connected Apple devices, and the ability to remove all BT connected items in one fell swoop, those options can be useful for other scenarios, but for troubleshooting purposes the reset seems to be most valuable. Keep in mind that if a Bluetooth device is too far away form the Mac it may also have problems connecting to the computer as well, you can monitor connection strength of Bluetooth devices with this trick if you’re uncertain about signal quality. This should not need to be done often since Bluetooth is typically pretty reliable on the Mac, but I had to reset Bluetooth on a MacBook Pro recently after using a PS4 controller with the Mac and later trying to add a similar PS3 controller which was refusing to be discovered by the Mac. The reset trick worked and now both gaming controllers work with the Mac as expected. Thanks to our friend Keir over at MacKungFu for discovering the debug menu item access, this should be useful to anyone who has fumbled through troubleshooting Bluetooth issues. This debug and reset options appear to be available only to the latest versions of MacOS and Mac OS X, but if you find it working in something prior to El Capitan let us know in the comments. I’m using Yosemite 10.10.5 and, while I didn’t go on to reset my bluetooth devices, the menu option did show up. So it works at least in Yosemite as well as El Cap. You only find the debug menu when you have a Bluetooth device connected. Is the debug action only for that connection or for all possible connections to other devices? Also shows up in 10.9.5, didn’t do reset. I am with you, no joy with Airdrop. Nope. Notta. El Crapitan won’t connect or see iOS devices anymore. The closest I came to getting it working was to delete the bluetooth plist, create a new contact in my address book on the iOS and OSX devices with my iCloud email address, turn off the firewall and hard reboot both devices. My iOS device suddenly appeared in Finder airdrop but I couldn’t connect to it. When I tried clicking a different folder then returning to airdrop my device disappeared and is gone. I was having a heck of a time trying to get an Auvio speaker to reliably pair with my MacBook Pro. Had to finally download Hardware IO Tools (free developer download from Apple) and use the Bluetooth Explorer to do pretty much the same thing. This shortcut would have saved me some time and, quite frankly, some bewildering menus. Thanks, this might be what I need to do get my macbook to recognize some skull candy earbuds that work fine with my iPhone, but not with my macbook or iMac. Thanks! yours was the one comment that helped me fix this nagging problem. Apple Wireless Mouse paired after some of the steps above but Apple Wireless Keyboard would not. Only thing that actually allowed successful pairing of the Apple Wireless Keyboard with a 2009 Mac mini was turning off the WiFi antenna via the WiFi menu. Thank you so much! Your comment worked for me too. This solved my BT connection issue with SoundLink Mini bluetooth speaker. Thank you. With only 1 meter between Macbook and bluetooth from QED i can hear a lot of noise. Reset didn’t helped at all. I have connected my bluetooth mouse, sometimes when my mac wakeup from sleep state, the bluetooth is automatically turned off in mac and it is not turning on even when i click “Turn on”. I had to restart the system anyway(even after “reset blutooth”). Is there any way to turn on bluetooth in mac without restarting ? my sub woofer has a problem when pairing,as soon as it pairs it doesnt it doesnt produce sound and if it does its a scatched one, any one with an idea? Isn’t Apple going to fix this really pesky issue that makes Bluetooth devices UNusable!!!!??? The issue has been around at least since 2012. How many years do you guys need to fix a small hardware problem!? Reboot the machine!? That is another 7 to 10 min + all the time I need to restore the state of any open applications. Altogether about 20 min. When people pay you 4K for souped up Mac Book Pro they expect quality and robustness to save time and money. The Bluetooth issue reduces productivity and costs companies time and money. Rather than ranting about Bluetooth on a random website that attempts to troubleshoot these issues, maybe you should contact Apple directly and let them know your concern. The rant is well received. If enough, in enough places, maybe apple will take notice. Contacting them for this problem will not help, they only say do the above suggested which may or may not work. Can anyone explain what is going on with my Bluetooth please. My Bluetooth keyboard would not work. My Bluetooth is turned off and the option to turn it on is greyed out. Then my keyboard started working. The Bluetooth still says it’s off. I can not get the full debug menu. So I can’t add any devices because it’s not on yet my keyboard works. The problem is that I cannot find the bluetooth icon neither on the top icon nor on the system preferences!!!! My bluetooth keyboard isnt working after installing os sierra!!! Now I cant login to my computer because I need to enter my password!!! Thanks! Resetting bluetooth and rebooting worked perfectly. Thanks for the useful advice! Sorry guys, this is not so useful, restarting your mac usually solves all bluetooth issues I have, that’s exactly the point, I need to restart my machine in order to make the stupid mac bluetooth work. That usually does the trick for me, but unfortunately not always. has collected an enormous amount of cached bluetooth devices, I guess they are stored everyone I take my laptop, once this file was deleted and devices are re-paired problems very lessened but no totally fixed. Yeah after travelling the system has picked up a lot of noise from third-party devices. If I get bluetooth refusing to reconnect after suspend I delete /Library/Preferences/com.apple.Bluetooth.plist and kill blued and toggle bluetooth in the menu bar. Still necessary with Sierra. Where do you find that apple.bluetooth.plist? I’ve tried everything. Thank you. Good luck and enjoy Bluetooth, charge those batteries too it won’t work if they are not charged. My mid-2011 Mac Mini started having an issue with the fan running at high speed while the machine was sleeping, and then wouldn’t wake from sleep (had to be powered off by holding the power button). This only seemed to happen overnight – short sleeps were okay. After a few days(nights) of this, my Magic Mouse 2 also stopped working. Resetting BT today via the debug menu fixed the mouse problem. I’ll let you know if the sleep problems are fixed as well. Thanks! Thank you! Your instructions above to reset fixed my Bluetooth issues! You saved me more headaches and a trip to the Apple Store and for that am grateful! Bluetooth performance – at least for audio devices – is by far my biggest complaint with OSX. Was on El Capitan, Yosemite, and now on Sierra. This instruction seems to have partially remedied my Bluetooth stuttering problem on Sierra 10.12.3, at least for now. Running on a MacBook air, paired to a GGMM M3 Wi-Fi Bluetooth Wireless Leather Speaker. I note that the speaker paired effortlessly with my iPhone and played without stuttering. It still stutters intermittently, whereas before the fix it stuttered constantly. I will ultimately activate the Airplay configuration of the M3. Very valuable and thank you! I’m wondering how do I ‘click” when bluetooth doesn’t work??? Do I go out and buy a mouse with a cable? I still don’t know how to fix this. Fixed my Bluetooth headphones stuttering problem. I’ve tried a bunch of things, but this actually worked. It worked! Thx a lot! You are such a lifesaver! I accidentally had my Mac forget bluetooth headphones. This fixed it. Fixed my problem. Thank you! I tried everything you mentioned above on my MacBook. Nothing worked. I’m confused about this now. This is the fist time I had ever experienced this. God bless you, the stuttering problem has been resolved almost completely and I also had a bad audio quality that is now okay. To solve the problem of occasional stuttering, could I use a wifi antenna to amplify the signal beyond 10 meters? Thanks so much for the detailed description! Worked great. Brilliant! fixed an issue with connectivity to one particular device, thank you. Also, keyboard and trackpad are both BT and reconnected without intervention. Macs and Bluetooth just don’t work together. So i did the shift option move and removed devices and reset under debugging but now I have no options for discovery or detecting my JBL speaker or anything else?? So close but so far. Anyone!!!???? I just updated to sierra. Works fine with my phone so no probs speaker bluetooth….OH MAC’s I love hate love hate you!! Always great to learn something new as a power user. Shift – Option doesn’t do anything. How else can I find the debug option? I’m losing my mind today without a keyboard and mouses. Thank you. Hold down SHIFT and OPTION keys while clicking the Bluetooth menu, that’s how you access the Debug menu option in Bluetooth. It works, try it out on Mac OS. I am doing it right now. Be sure you change your batteries too, if batteries aren’t charged you can’t use the Bluetooth keyboard and mouse. I have a 27″ IMac with Sierra OS. For reasons written several times above, my device suddenly started dropping Bluetooth capabilities. This is frustrating as every time I leave the computer inactive for a period of time, the Bluetooth drops and I can’t do anything except reboot (hard). I have tried all the “debug” suggestions. I have tried resetting the Pram. I disconnected the Bluetooth settings. I disconnected any/all Bluetooth devices. Right now I’m ready to return to Microsoft because of the inconvenience. Does anyone have any new suggestions? – Change the Bluetooth device batteries. – Try a new/different Bluetooth device see if it happens on there too. Personally my Apple Keyboard bluetooth flakes out only when the battery is low. Works great, thanks for help! The bluetooth on my MacBook Air is “not available” and has the zig zag line through the icon in the upper right of my desktop. If I option click on the bluetooth icon, nothing happens. If I shift+option click on the bluetooth icon, nothing happens. I have tested these on my MacBook Pro (that is not having a bluetooth issue) and these commands work perfectly. Is there a way to run the debug program manually? It must exist somewhere on the computer, correct?